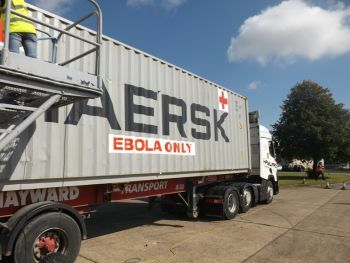 The international charity, HIS Church, based in Lincolnshire, the United Kingdom has dispatched three- 40 foot containers to Liberia containing food and non-food items to assist indigent communities throughout the country in the wake of the untold sufferings caused by the Ebola virus outbreak. The items, estimated at $1.4 million United States dollars, are in response to a special appeal made to the charity by the Vice President, Joseph N. Boakai recently. According to the Coordinator at HIS Church Charity, Mr. Richard Humphrey, "his organization is immensely pleased to identify with Liberia at this critical time in the country's history especially considering the devastating effect the ongoing Ebola virus has had on the human capacity and infrastructure developments initiated by the government of President Ellen Johnson Sirleaf". Speaking further he said, one of the containers is loaded specifically with items to assist communities devastated by the Ebola outbreak. The items include mattresses, beddings, kitchenware, clothing, sewing machines, high grade Basmati rice, high visibility jackets, handbags, anti-bacteria lotions among others. He noted that "the food and non-food items are intended to assist residents in quarantined communities with basic needs while helping to contain the spread of the virus and the lost of additional lives". Also speaking at the loading bay in Lincolnshire, the Liberian Ambassador to the United Kingdom of Great Britain and Northern Ireland, His Excellency Rudolf von Ballmoos thanked HIS Church Charity on behalf of the President, government and people of Liberia for the huge consignment of items designated for the people of Liberia, noting that, "the gesture on the part of HIS Church Charity demonstrates the level of concern shown by international organizations towards the eradication of the Ebola virus from Liberia. He said, the unexpected emergence of the Ebola virus at a time when the government is pursuing a protracted transformation agenda following years of civil conflict has the potential to cause distractions but assured that the government of President Ellen Johnson Sirleaf remains committed to eliminating the virus from the country with the support of all friendly governments and international organizations. The containers are being loaded at the Felixstowe port outside of London and is expected to arrive in Liberia by the end of September.